After 20 months, The Lost Wanderer – the 2006 Dodge van we were living in finally gave up the ghost. However thanks to some famley and friends we have upgraded. At the end of Feb 2017 My father-in-law gave the wife his2006 Toyota Carrola. it’s in pretty good condition. 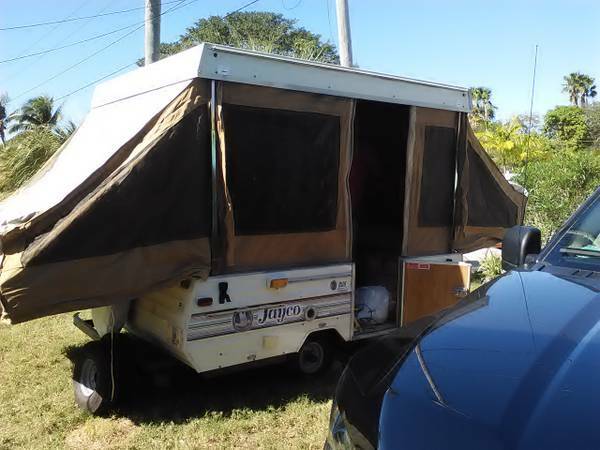 On March 1st we bought a 1989 Jayco 806 popup trailer. The trailer is light enough that we can tow it with the car if we chose, however for longer distances we may – funds permitting – rent a truck with a better towing capacity. We are in the process of looking for a park with a decent monthly rate that we can stay at long term. Right now that is proving hard due to all the snowbirds in Florida. We also took the opportunity to improve our communications. While Google Voice is great for most phone needs, it still needs internet and when your internet is based on whether-or-not a store had free WiFi it can be difficult. I picked up a cheap prepaid cellphone on a plan that includes unlimited data (on the phone) and a mobile hotspot (limited data). Hopefully this will help alot. Over the next weeks and months as we get setup in out new rig I hope to post more about it in the new Camp Life category.